This recipe is inspired by the flavors of the middle east. 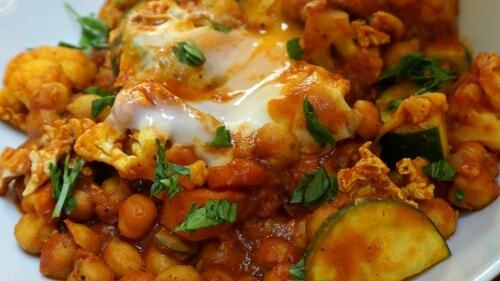 I really enjoy shukshuka, an Israeli recipe with poached eggs in a tomato sauce served with fresh bread for dipping. This version adds more vegetables and curry for a heartier dish that’s bursting with flavor. 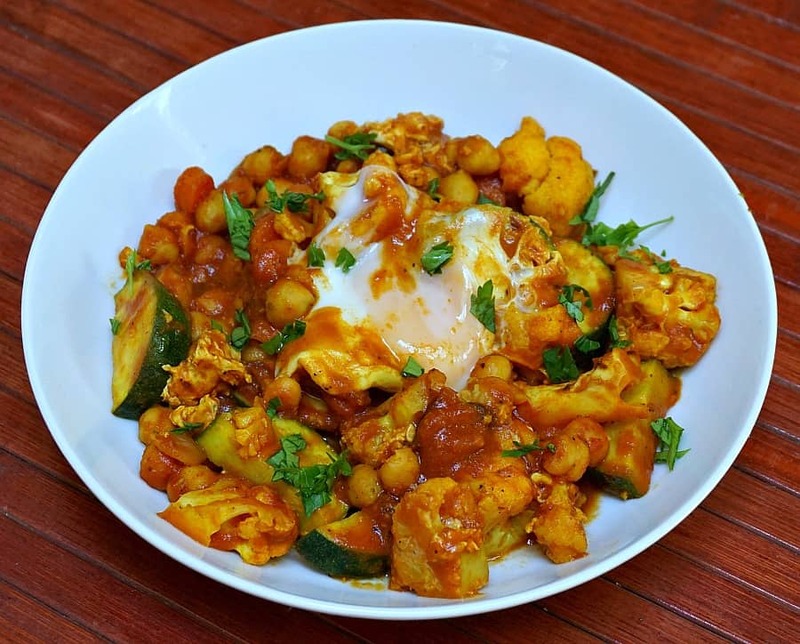 If you enjoy curry and are looking for a new dish to perk up your Sunday brunch menu, or an easy pantry dish for every night – this is it. 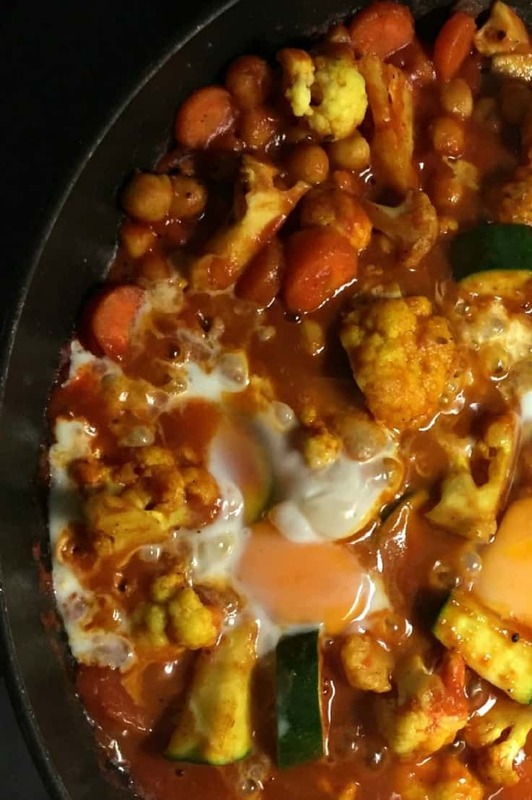 It pairs fresh cauliflower, zucchini along with hearty chickpeas (garbanzo beans) in a rich tomato sauce with aromatic herbs. The creamy yolks from the poached eggs add an additional rich creamy element that makes the whole dish come together. It’s quick, easy and something a little different to add to your favorite recipe collection. Serve with your favorite sauce, such as sriracha for an extra kick, along with your favorite bread. Add the onions to a saute pan over medium heat. Cook for 3 minutes, then add the garlic and saute for another 2 minutes. Do not allow them to burn. Add the dry spices and the zucchini. Cook for about 3 minutes until the spices become aromatic. Add the water and tomato sauce, stir and cover. Allow it to simmer until the cauliflower is tender. Carefully crack each egg into the pan, making sure not to break the yolk. Do not stir. Cover and cook until the eggs reach your desired level of doneness (I prefer the yolk to run slightly to combine with the tomato gravy and make it rich and creamy). Spoon into bowls and garnish with parsley or cilantro and your favorite hot sauce. Visit our Food Finds/Recipes section to see our entire collection of recipes inspired by our travels around the world. And if you also love to travel, you can find our money tips to save money and travel more comfortably compiled after 2+ years of full-time travel in our Resources Section.